Ask members what they love about Congregation Beth Ahm of West Essex in Verona, and inevitably the conversation comes around to the rabbi, Aaron Kriegel. “We fell in love with the rabbi. He’s just a nice person. You just know that sitting with him — there’s a comfort level,” said Laurie Brandt. She and her husband, who live in Verona, walked in off the street one day, “just to take a peek,” she said. The rabbi spent an hour speaking with her husband in his office, and they’ve been members ever since. And after just six years, Brandt, who also serves as congregation vice president, volunteered to chair the synagogue’s 75th anniversary gala, which took place June 12. Brandt’s experience typifies interactions at the small synagogue that now numbers about 160 member units. Many say they love the intimacy, the warmth, the closeness, the community, and the lack of artifice or pomp that characterize Beth Ahm. 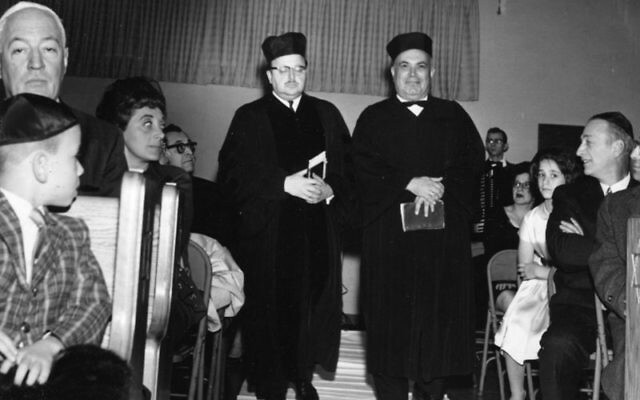 Those qualities are a close reflection not only of Kriegel, who has led the community since 2001, but also of his father Alter, who led the synagogue from 1937 until 1974. In many ways, the congregation reflects the values of the family that has led it through two generations. Marvin Solomon of Spring Lake, who grew up in Verona and celebrated the first bar mitzva at the synagogue in 1941, returned for many High Holy Day services. He recalled that the group that became the founders of the synagogue, including his father, Hirsch Solomon, had their first meetings in 1936 at the Verona restaurant his father owned. The Jewish community in Verona was growing; in May 1936, the synagogue was established. A year later, Rabbi Alter Kriegel was hired and, that same year, the congregation purchased its home at 56 Grove St. and dedicated its first Torah scroll. Alter Kriegel believed a synagogue ought to draw its members from the community and serve as a hub; the congregation was at first known as the Jewish Community Center of Verona. The first Rabbi Kriegel helped establish it as a positive force in the town. “Alter Kriegel was very involved in the larger Verona community,” recalled Marc Wurgaft of Montclair, a past president who grew up at the synagogue and returned as an adult with his wife and child. “When they first started, there weren’t many Jews and there was some anti-Semitism. But over the years, Alter became a fixture in the town,” he said. The late 1940s, ’50s, and ’60s saw expansions, construction, renovation — including a new building in 1949 and the start of a religious school. There were dances, dinners and celebrations, and the community thrived. 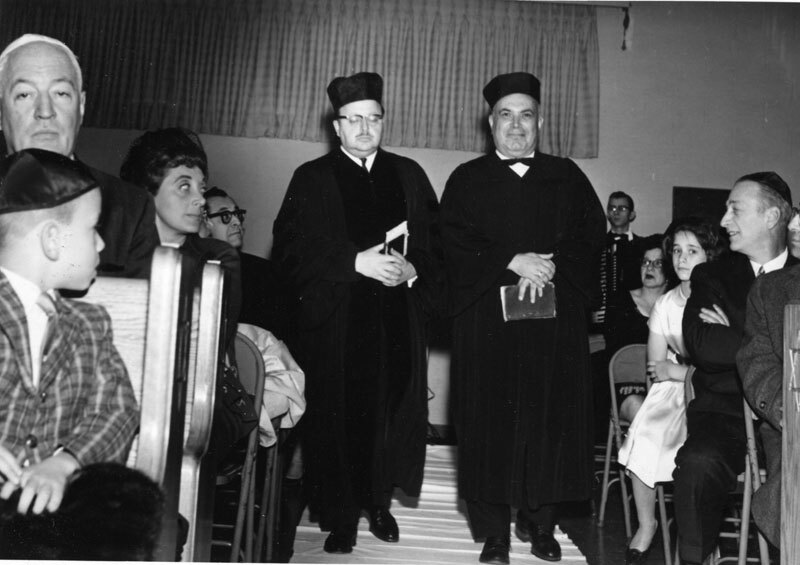 After Alter retired in 1974, the synagogue went through a period of flux. The Jewish community had been shrinking in the town, and many blame a spurt of anti-Semitism that erupted after the school board president, who was Jewish, decided to bus 40 African-American students from Newark into the Verona schools in 1968. The community is much smaller today than when he and Wurgaft were growing up — at that time it was close to its peak of 350 members. But both say it’s the same shul, from the sense of family to the little rituals. Wurgaft pointed to the singing of “America” after every service, something Alter Kriegel instituted during World War II. According to historical records, Alter Kriegel said, “We will sing ‘America’ until all our servicemen come back to the synagogue.” But one member, Private Max Novick, was killed in action, so they continued to sing through the decades. For Aaron Kriegel, there are moments when serving in the synagogue where he grew up is bittersweet. One of his first duties upon his return to Beth Ahm was burying someone “who probably helped diaper me,” he said. Aaron has expanded on his father’s philosophy, joining many community organizations, from the rescue squad to the library board. Like his father, who hired a hasidic rabbi to tutor him before he entered rabbinical school, he is open to different ideas and opinions. The synagogue hosts the Montclair Jewish Coop, a secular Jewish religious school and community; it participates in a Christian-Jewish biblical text study series; and it is about to house the West Orange Cooperative Yeshiva, an Orthodox day school. Beth Ahm hosts any number of community groups, from Alcoholics Anonymous to a group for parents of autistic kids. “The synagogue should be a place that is busy every day of the week with activities that help the Jewish community and the secular community,” Aaron Kriegel said. He plans to stay until he retires. The biggest challenge facing the synagogue, according to Wurgaft, is neither financial issues nor membership. “It’s what are we going to do when Aaron retires.” But everyone has faith enough that they will have another gala in 25 years. “But I probably won’t be chairing that event,” quipped Brandt. Over 100 people gathered at the Richfield Regency in Verona for the synagogue’s 75th anniversary gala. On the preceding Shabbat, “alumni” of the synagogue were invited to lead and participate in services. “You never forget your first love,” wrote Irv Newman in a letter published on the occasion in the synagogue bulletin. Newman, who retired to Sarasota, Fla., with his wife, Bea, has been a member since the 1950s and came in for the gala. Dean Gordon, the current president, who joined in 2003, said his big focus is bringing in new members. The religious school is on the rise again, with just under 20 families this year and 32 registered for next year. “We want to stay a small, warm community,” he said. “But we also want to get into the larger community a little more, so we get better known and can bring in more members, especially younger families.